Hey everyone. Hope your day is going well. I wish the warm weather was here instead of the 40 degree weather. So i guess we are suppose to get 6 inches of snow this weekend. I am hoping there wrong. Guess we are going to have to Waite and see. Are one year anniversary is coming up and i don't know what to get him.Any ideas.? He has about everything and i really don't know what to get him. lol. Why is it so hard to shop for men.? 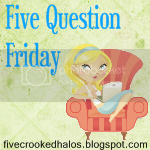 Well i am linking up with 5 Friday Questions. 1.) 1. What advice would you give a newly married couple? Well i am not married yet but i would say never go to bed mad at your spouse. 2.) Who does more laundry around your house? I do of course. He does do laundry but, seems like i do it most of the time. 3.) What items, if any, do you prefer to buy organic or make yourself? I prefer my vegetables to be organic. That is about the only thing i buy organic. 4.) What book/TV series would you recommend for a friend on bedrest? Well, If they like mysteries or csi shows i would recommend Bones,NCIS,CSI, Supernatural, The Mentalist. 5.) So, they say it's Spring now...what does your "spring" look like at this very moment? Cold,Windy, and just plain cold. 1. The wind blew wildly and blew some tree branches on the ground. 2. While going grocery shopping and meeting Mr.Z and Wolfie out getting some food while up the hill made me feel warm and happy all over. 3.The smell of bacon makes me happy all over it smells so good and it makes the house smell so good. 4.When I am feeling lazy I sit in my comfy chair and grab the remote to watch the tv and relax. 5. Brilliant apple candy red is my favorite color - like the color that shows behind the wave when it breaks. 6. The door creaked shut a few minutes ago and i turned around to see him closing the door and came in. 7. And as for the weekend, tonight I'm looking forward to going to bed.tomorrow my plans include work and cleaning house. and Sunday, I want to rest a bit before going back into work. 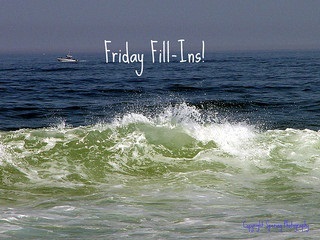 Up next is Friday Fill in Four. 1.) My teeth is my least favorite feature. 2. )I was a very shy as a child. 3. )The first room that i clean in my house is my bathroom because it is the least favorite room i hate to clean. 4. )If i had the guts to ride in a hot air balloon then i could enjoy the view up in the clouds.